Oakley's Radar Pace smart sports sunglasses, built in collaboration with Intel, are now available from Oakley Stores and Sunglass Hut locations across Europe, the US and Australia. The voice activated sports specs were teased on stage at CES 2016 after years of development - Intel signed a deal with Oakley's parent company Luxottica way, way back in December 2014. So what's so exciting? The Pace, which cost $449, include a pair of removable earphones, built into the frames. These include three microphones and a host of sensors - an accelerometer, gyroscope, barometer and humidity and proximity sensors. We don't know what exact Intel chip is being used, we assume it's Curie. The wearable doesn't overlay an AR display on top of the wearer's vision, like Google Glass and the sporty Recon Jet. Scott Smith, vice president of strategic partnerships at Luxottica, gave us insight as to why the decision was made not to take this route with this wearable device. "Display technology is still evolving," Smith explained. "We didn't feel there was a technology out there that was mature enough. For these particular use cases and sports we found audio was the best vehicle to get the information to users without having to look down and do things that would break stride or break form." Instead all the controls and coaching are handled via Intel's Real Speech natural language processing tech. You can interact with Siri or Google Voice if you like but if you start a command with 'OK Radar' you can access fitness information like what workout you're doing that day, coaching on lowering or increasing your pace and heart rate data (from a third party monitor). Then over in the companion Radar Pace app for iOS and Android you can enter your personal stats and manage workout goals as you go. While training programs are not customisable (yet), both Intel and Oakley had a part to play in how these programs were created. "There was a lot of work from both sides," Smith explained. "Both Intel and Oakley contributed. On the Oakley side, we have access to a lot of athletes, some of which are contract athletes with us. So we were able to pull in a lot of expertise." Oakley is referring to its real time coaching as helping athletes, so it's not clear how amateur it expects its customer base to be. Luiz Dias is the manager of the wearable technology division at Oakley and revealed how the experience will differ for users in different parts of the world. "When we are talking about processing data in real time and delivering it when people need it most, that was definitely a big learning curve for us," Dias said. "We support five different languages and there's very different coaches for these languages. In different regions, it will coach in different ways." The smartglasses are compatible with other fitness apps and devices including Strava letting you export data when you need to closely analyse your performance. As an obvious extra, you can also play music from your phone via Bluetooth and take phone calls and there's touch sensitive controls for this - the voice control is all hands free. A big selling point here is that they look just like regular Oakley sunglasses - from the front at least - and you can swap out the lenses for the ones you like, including from its Prism range. In terms of battery life, you can expect to get 4-6 hours from the Pace. As far as improving the functionality of the smart specs in the future, this is something that users can look forward to. "We designed the hardware to live for a while in the market," Dias told us. "We will be pushing software updates that add functionality. The hardware is prepared to receive more capability than it currently has today." 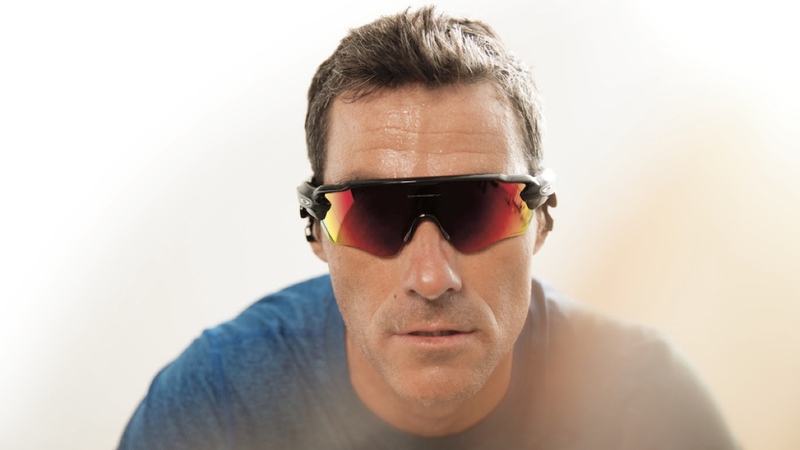 Oakley and Luxottica are not ruling out bringing the tech out of the sports tracking realms as well. "Potentially we could do something from a more lifestyle standpoint that fits more with one of the other Luxxotica brands," Smith revealed. We've already been putting the Oakley Radar Pace through its er.. paces so you can check out our Oakley Radar Pace review to see what we made of it.